Why stay miles away when you can stay on beautiful Windward Cay. Close to 192 in Kissimmee, Disney less than 10 minutes. 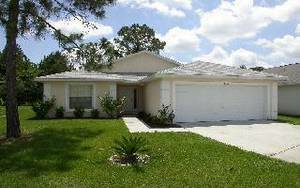 Our executive home is situated at Windward Cay a hidden jewel in Kissimmee's crown! Our home 'Welcome Aboard' is furnished and fitted to a very high standard and has a Maritime Theme. We can't stress enough how stunning our home is and we really mean it!! You will want for nothing Come in and luxuriate in our stylish home from home. Ask us about previous guests comments. 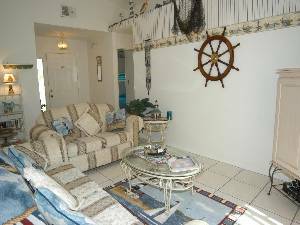 Just minutes from the attractions but close to all that the 192 has to offer, with its abundance of Restaurants Shops etc. Golf 5 minute drive. Disney less than 10 minutes. Medieval Times Dinner Show 2 mins. Helicopter Rides 2 mins. 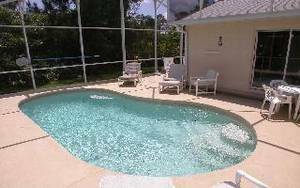 There are 3 local golf courses, fishing, boating, walking trails, wildlife and bird watching, Orlando International Airport 20 minutes. 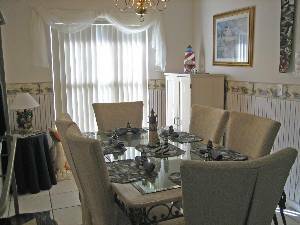 Accommodation comprises of: family room with cable TV DVD and CD system. Dining room seats 6. FREE USE OF PC WITH HIGH SPEED INTERNET ACCESS! Kitchen with breakfast bar, all appliances crockery cutlery and cooking utensils. We even have an automatic electric kettle for your tea! Telephone and answer machine. 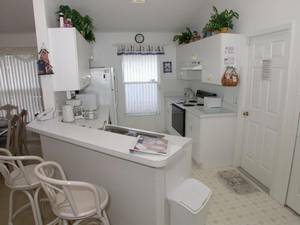 Laundry area with washer drier iron and ironing board. 'Captains Cabin' master bedroom with King four poster bed cable TV and VCR and en-suite with garden tub and twin washbasins, door to lanai. 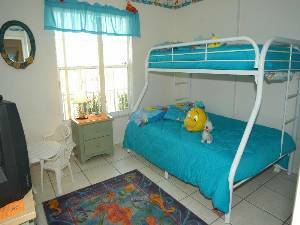 'Flounders' kids room with bunks, single top double bottom (two adults can sleep on this full size double) Cable TV and VCR books toys videos games. Dolphin Family bathroom with tub and shower. All linen and towels included. We have a rollaway bed crib(cot) highchair and stroller(buggy) safety gates baby alarms for your use free of charge and there are hairdryers in both bathrooms. 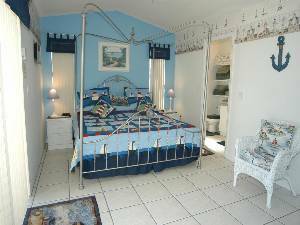 Fully air conditioned with ceiling fans in ALL rooms, we have tried to make our house a home for your vacation. Little Tikes Toys Board Games and more! Watch the birds and friendly squirrels from our deck! Pool area not overlooked at all! Table chairs Loungers and Barbecue for your enjoyment! Security system and fire alarms. All TVs have 100 plus channels. Local Management on call. Fully inspected and Licensed by the State of Florida. Games area, foosball, shuffleboard, and magnetic darts. 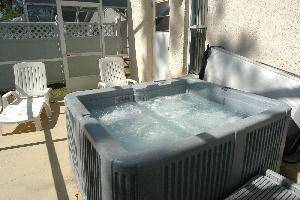 Low Season Jan, Feb, Early March, Late Nov not Thanksgiving, and Early Dec $700 or £425. Mid Season Late March, April, May, June, Sep, and Early Nov $750 or £450. High Season Easter, Christmas, July, Aug, Oct and Thanksgiving $850 or £500. All rates include taxes and cleaning. We do not accept bookings of less than 5 days 5-7 days incur a cleaning charge. We require a deposit of $200(£200) to book the home. Balance due 2 months before departure. Returnable security deposit of $200. (£100) We accept Visa/MasterCard 3.5% processing fee. Deposit: $200 /£200 booking deposit. Security deposit for damage $200 /£200. Cancellations and Refunds: Non returnable booking deposit.